The daily scorecard is one of the most essential features in Databox that will help you understand how your business changes on a day-to-day basis. 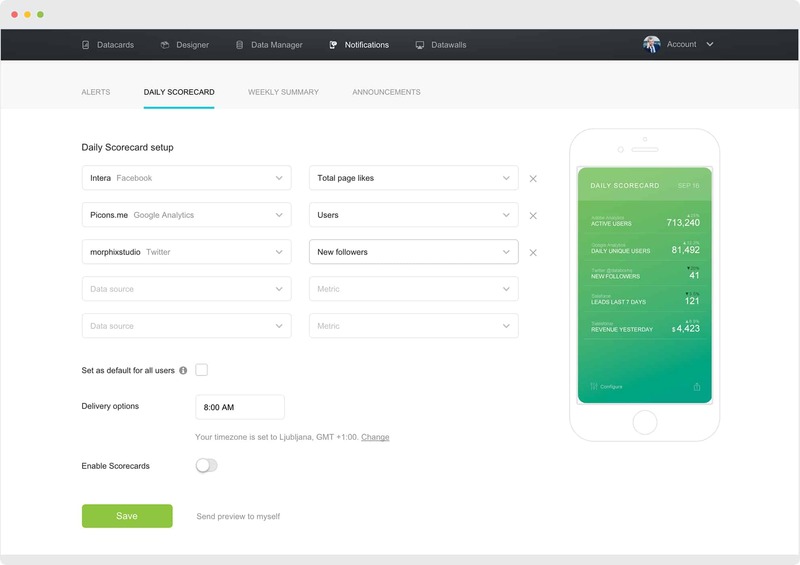 Scorecard is essentially a short daily report comprised of up to 5 of your most important metrics from yesterday, delivered to you either by push notification or email every morning. When you create a new Databox account, we’ll automatically configure a scorecard for you based on the metrics you’ve selected for your first data source. But that’s just a starting point. We encourage you to customize it and add metrics that will be of the most value to you and help you kickstart your morning. There are two easy ways of doing that. 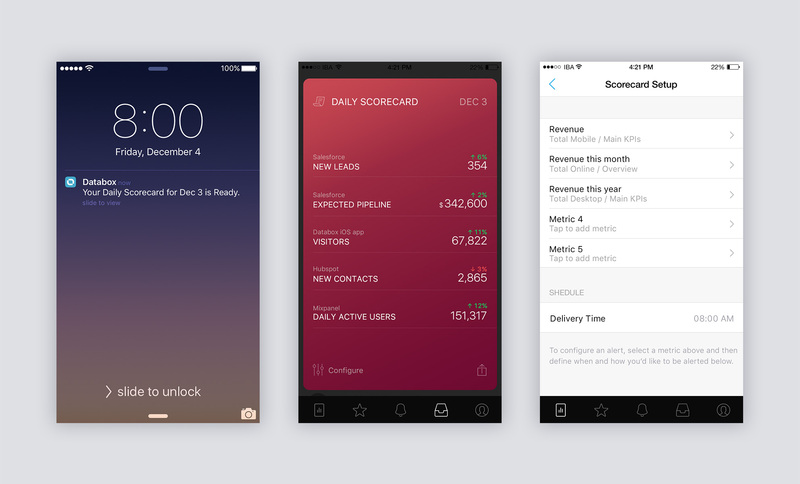 If you’re just looking to set up or customize your own daily scorecard, you can do the right from the mobile app. When in the app, tap on the last item in the menu bar to go to the Account section. Tap on Daily Scorecard and you should immediately see the current state of the scorecard with the five fields either populated or blank. Tapping on any of these fields will take you through a simple two-step process to add or edit that field. First you’ll select the data source, and after that you can select a metric. And that’s it! You can also set a delivery time at the bottom of this screen. Changes to your scorecard will be saved automatically, so the next time you’re scheduled to get a scorecard, it will include all of your new changes. Account owners and administrators can easily set up or edit scorecards right from the Databox Designer. To do that, just navigate to https://app.databox.com and sign in with your Databox credentials. On the upper main menu, click on Notifications. In the sub-menu select Daily scorecard, and you’ll see the interface used for editing scorecards. For each of the five rows you’ll need to define the data source (integration) and the metric that you want to pull from the source. You’re not required to enter any time intervals, since the daily scorecard always takes the metric value from yesterday. Pro tip: There’s no need to fill it all up! If you only want to get daily updates about a couple of metrics, then go right ahead. It’s all about paying attention to the metrics that matter to you! Just select the right details for the metrics you want to see and simply leave the rest blank. At the bottom you’ll see two additional options. If you select Set as default for all users, this scorecard will be sent to all of the users within your account every morning at delivery time, except for those that have already created their personal scorecard. The delivery options section will allow you to choose which time of day you’d like your daily scorecard delivered at (based on your time zone). No matter what time you select, it will always include data from yesterday. If at any time you wish to stop your scorecard from being sent to you, just switch off the Enable scorecard option. Note: Even if you’re an admin, this will turn off the scorecard only for you and will not affect other users. Once you click on save, your scorecard settings will be updated and activated. If you want to see a preview of what your scorecard will look like before setting it live, you can do that by selecting Send a preview to myself. As with the alerts and conversations in Databox, making sure the scorecard is delivered is of our top priority. That’s why all the scorecards going out are equipped with a fallback system that will verify if you have successfully received the scorecard via push notification and, if that’s not the case, send it to you one more time in an email. This also applies to the case of user not having push notifications enabled.